These beautiful long natural Roses large flowered Roses are dipped in wax and therefore have a protective layer, the Rose flower remain in perfect condition up to several weeks and are available in beautiful color combinations. 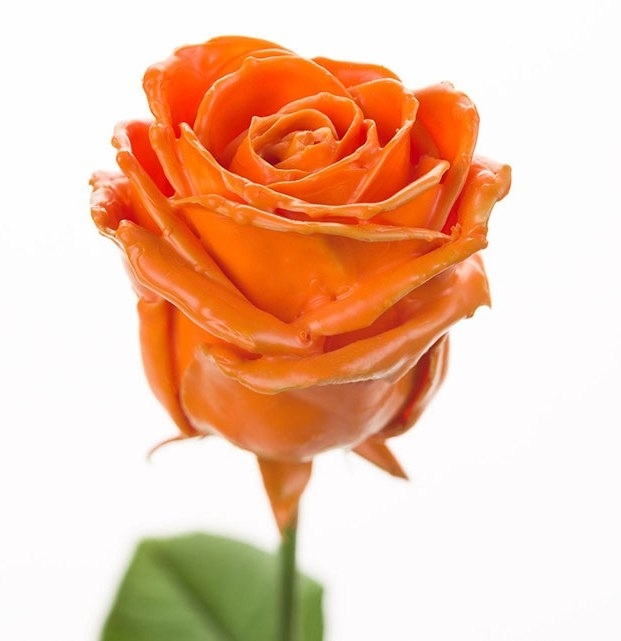 These wax Roses have a uniform orange color. The large Rose flower remains as it is and does not open like natural Roses, however, the Rose flower is dipped in the wax while the opening stage of the flower is at its most beautiful and stays in that opening stage in the vase. You can determine the number of Roses that you want to order by entering the quantity in the box before the shopping cart, however the minimum number of Roses is 10 Roses. On the basis of the number of Roses ordered by you, a Rose bouquet is made by hand and you or the person who receives the Roses will receive a beautiful hand tied Rose bouquet.